The European Union Tobacco Products Directive has introduced an EU wide tracking and tracing process to combat the illicit trade of tobacco products using DotCode. This directive includes the use of a new symbology called “DotCode” that includes information such as manufacturing date and time, market of retail sales, and intended shipment route. To support this directive and enable the reading of DotCode, Honeywell are releasing a new High Density Optics for the N670X Series, called N6703HD. The HD optics improves near field reading by 18% in average compared to N6703SR, but the far field decreases by an average of 10%. On their printed 5mil DotCode, tested onto 5 samples, N6703HD depth of field is 4X to 5X wider than its predecessors. OMRON has announced the global release of its new FHV7-series Smart Camera combined with illumination and image processing functionality for advanced vision inspections. 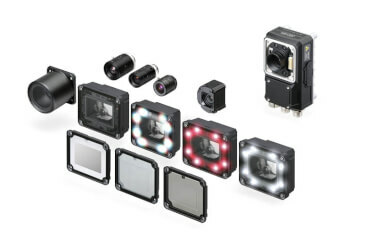 Thanks to the world’s first multi-color light*1 and a best-in-class*2 12-megapixel high-resolution camera, only a single FHV7-series Smart Camera is required for achieving the industry’s highest standards of precision in vision inspections on a high-mix production line. The autofocus lens covers a focal length range from 59 to 2,000 mm*4. Even when products in different sizes are produced, the focus range can be changed easily by parameters. This eliminates the need for a mechanism for moving the camera, reducing design work and component costs. Dual-core CPU provides the fastest image processing speed among smart cameras – four times faster than the previous speed. Production cycle time can be maintained even if resolution is increased or inspection items added.